I haven't talked much about hair care on my blog before. That's mostly because I'm not very diligent with my hair care routine. I'll often choose to spend my time getting ready doing my makeup or picking a cute outfit and I'll forgo styling my hair, instead leaving it natural. 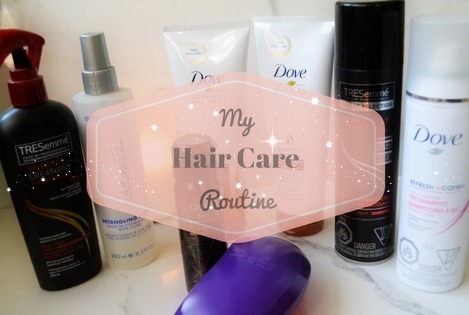 However there are a few hair products that I swear by and I thought I would share. I'll start with my hair type. I have medium length, fine, brown hair. I've never coloured it and I rarely use heat (my fine hair air dries quite quickly). My hair varies between straight and wavy whenever it pleases despite what I have planned for it. I've just started using the Dove Advanced Hair Series- quench Absolute for dry, wavy, curly hair. I've been loving it. It makes my hair really shiny and soft. The shampoo lathers up nicely which I always enjoy and the conditioner isn't too thick so it doesn't weigh my fine hair down. Strangely my hair dries straighter when I use this shampoo compared to other shampoos not specifically for wavy hair. I have been using this Sebastian Professional Laminates Detanging Milk for years now. I just spray it through my wet hair and brush it through. It smells really nice and it leaves my hair super soft and shiny and most importantly it helps me get a brush through my fine, tangly hair. On the rare occasion that I blow dry or curl my hair, I'll use the TRESemmé Thermal Creations Heat Tamer Spray to protect my hair. It smells nice, it comes out in a fine mist and it leaves my hair shiny and smooth all while keeping my hair from being damaged. I have very tangly hair due to it being so fine. Brushing my hair was always a chore I hated because it usually hurt and took a long time. Everything has changed since I got the Tangle Teezer. It gets out tangles and knots in seconds. It's seriously magical and I highly recommend it to everyone. I wash my hair every other day so for second day hair, I use Dove Invigorating Dry Shampoo to make my hair look less oily. The smell isn't too over powering and as long as you're careful with the distance you're spraying from, you won't end up with white in your hair. It also provides lots of volume. This is an expensive little product so for special occasions I'll use a some of this Orbe Dry Texturizing Spray. It gives a crazy amount of volume and texture. It's amazing! As I rarely curl my hair, I don't often use hairspray but I thought I should include it anyway because finding a hairspray I actually like has been a hard task. I use the TRESemmé Perfectly (un)Done Waves Ultra Brushable Hold Hairspray. I hate hairsprays that make my hair feel hard and crunchy so this one is ideal for me. The hold isn't anything too special but it leaves my hair feeling naturally movable. I have many, many more hair products, these are just the ones I use most often, so let me know if you'd like to see a hair product collection post.